You know that thing you've been dying to get off your chest? Well, now is the time to share it! We've teamed up with independent publishing house Faber and Faber to champion and celebrate creative female voices in our new campaign, Women With Something To Say. Every day for the next fortnight, Faber authors will take over the Tatty Devine blog to share their thoughts on what it means to be a woman in today's society. Take a closer look at each author's photograph - they'll be wearing a bespoke Name Necklace or Speech Bubble Necklace inspired by their piece and made especially for them. ‘Object’, verb and noun, struck me as a meaningful word for women today. 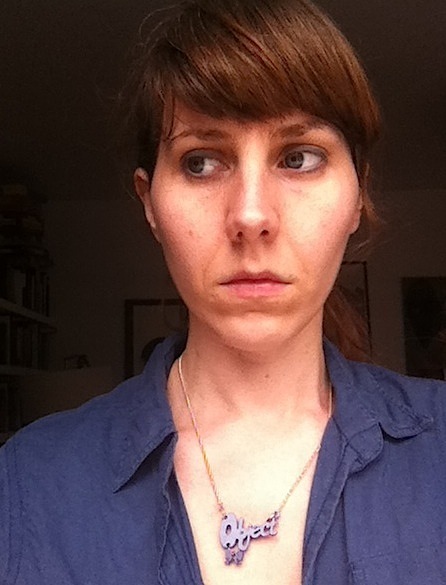 Primarily as an imperative, a call to arms (‘Object!’), but also an open acknowledgement of the endemic objectification of women – where the necklace becomes a kind of label around the neck of the wearer: ‘object’. While there is much to celebrate about being or identifying as female in our culture, the objectification of women – not just sexual objectification, but anything which denies women agency (see for example this Huffington Post article) – is so ingrained that we sometimes barely notice it, or unwittingly collude with it. I wanted to choose a word that owned up to this and drew attention to the uncomfortable proximity of these positions in the lives of many women. An expression of empowerment, if not a straightforward one. Thank you, Emily! What are your thoughts on objectification and the role of women today? Join in the conversation in the comments below or tweet us using the hashtag #WWSTS.